Over the last couple of years, we have received reports of broken windscreens on a very small number of Aeroprakt aircraft in Australia. A couple of these were definitely due to bird strikes. However, the cause of a couple of others has never been finally agreed. The factory reports a very limited number of screen failures in the rest of the world – I believe two or three more – in addition to those reported in Australia. This is out of a total world fleet of over 1,100 aircraft spanning 22 years of production. In an effort to establish potential causes, and thus introduce preventative measures, we have agreed to publish as much information as possible and seek owner responses where appropriate. 1. The windscreen design and material have proven themselves on hundreds of Aeroprakt airplanes. Screen collapse cases are extremely rare and have never been associated with the design, but usually pre-existing cracks. 2. Current windscreens are made not of polycarbonate plastic but of PET (Polyethylene terephthalate), so any ‘polycarbonate approved’ cleaner may not be suitable for PET. 3. The effect of unsuitable cleaners (including gasoline, Windex®, Mr Sheen®, solvents which may be suitable for acrylic screens or any other non-PET approved solvents) on the structural properties is such that the PET glass may become brittle (crack-prone) in stressed areas (although in non-stressed areas it has no such effect). 4. The factory does not make oversize rivet holes in the glass because it makes no sense as the rivets compress – that is, produce stress in – the glass anyway. 5. All-aluminium rivets are used to secure the windscreens. This means every part of the rivet is aluminium – including the shaft, which is not steel, as per regular ‘pop’ rivets. 6. The recommended sealant for PET and polycarbonate windscreen replacement is now an acrylic transparent sealer such as FulaSeal 701, not a silicone sealer, which should be used sparingly. Excessive use of sealer can potentially weaken the screen. 7. Finally, a thicker glass is not a good solution as it will be under even higher stress in the areas where it is formed to the required shape. Therefore it will be even more prone to cracking. In the past, based on local engineers advice, it has been Foxbat Australia’s understanding that the windscreens of A22 and A32 aircraft were polycarbonate sheet and as part of our new owner pack, we have included a canister of proprietary polycarbonate screen cleaner. We have also in good faith recommended these cleaners to existing owners. None of these products expressly forbids their use on PET, nor can we find any information regarding their suitability for PET – indeed, they all make generic statements like ‘suitable for cleaning all plastics’. However, at the present time, we strongly recommend that owners/pilots of Aeroprakt aircraft stop using these types of cleaner on their windscreens until such time as their manufacturers confirm without reservation and in writing that they are suitable for PET. So how should you clean your Foxbat/Kelpie or Vixxen windscreen? 1. We recommend cleaning PET (or polycarbonate) plastics first with a mild solution of soap or detergent and warm water. It is also possible safely to use a specialty cleaning product such as Novus® No.1 or Brillianize. 2. DO NOT use window cleaning fluids with ammonia (such as Windex®, or Formula 409®), Mr Sheen®, gasoline, denatured alcohol, carbon tetrachloride, or acetone, which will cause the plastics to craze with minute cracks. 3. DO NOT use so-called ‘aviation approved’ screen cleaners as these may have been formulated for cleaning other types of plastics. 4. Begin by gently blowing away any loose dust, dirt and dead bugs from the surface. DO NOT use a pressure washer on any part of the aircraft, including the screen. 5. DO NOT use proprietary chemicals (such as ‘Bug Off’) to soften and remove dead bugs from the screen. Simply spray a weak solution of soap and water on the screen and let it soak for 5-10 minutes, re-spraying if needed to keep the surface wet. Then wipe with a wet non-abrasive/non-contaminating/lint-free soft cloth, microfibre cloth, or cellulose sponge. Rinse well with plenty of clean, clear water. You may need to repeat this process a couple of times to remove all dried-on dead bugs. 6. To give a final clean to the screen, apply the specialty cleaning product (or a weak soap and water solution) with a dampened non-abrasive/non-contaminating/lint-free soft cloth, microfibre cloth, or cellulose sponge. 7. Rinse well with plenty of clean, clear water. 8. Pat dry with a chamois leather, damp cellulose sponge, or microfibre cloth to prevent water spotting. 9. Repeat this process regularly to ensure there is no build up of dirt on the windscreen. If possible, clean a dirty screen immediately after flight to stop dirt etc hardening during the time before you next fly. Thank you for your attention – please leave a comment below if you feel it’s appropriate. 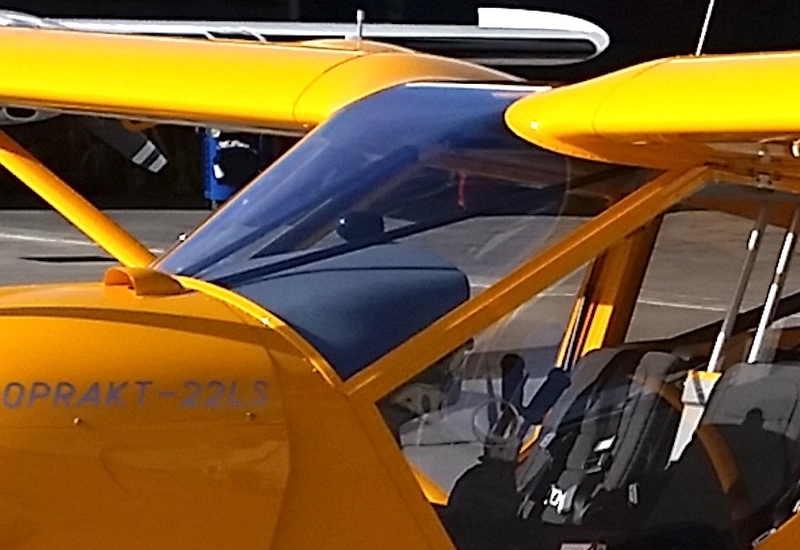 This entry was posted in Foxbat Technical, Light Sport Aircraft (LSA) and tagged PET, polycarbonate. acrylic, windscreen by PeterFoxbat. Bookmark the permalink. I guess then that the “aviation approved” spray cleaner called Plexus is then not recommended? I don’t see them state anything to the contrary for use with PET surfaces. I have just seen a similar comment from Matt before posting this one. Plexus has been used on my previous aircraft (Jabiru) for around 10 years as well as the past 2 years on my Vixxen A32 with no issues to date. I will revert to soapy water till I see more clarity on the matter. Will also try the Novus No:1 product this weekend. Matt – to be honest, we aren’t completely sure. Both Plexus and Vuplex say their cleaners are OK for all types of plastic sheet, although they don’t specifically mention PET. The factory says to avoid using them and stick to a weak solution of soapy water followed by clean water rinsing and a leather or microfibre to dry off. wow, I’ve been using Plexus for 7 years on my Foxbat (and another 10yrs on my Cessna) and its a brilliant product. Well, I’d say that if you have been using Plexus for so long without any crazing or cracking (as indeed, I have myself), then it’s probably OK to continue.